As many of you already know, we absolutely adore Lisbon. Whether we’re walking down the long and wide palm tree covered Avenida da Liberdade, ogling the moss covered fountains that trickle below tall rubenesque statues, or devouring a fresh and delicious seafood lunch, we seem to leave the city already planning our next visit. 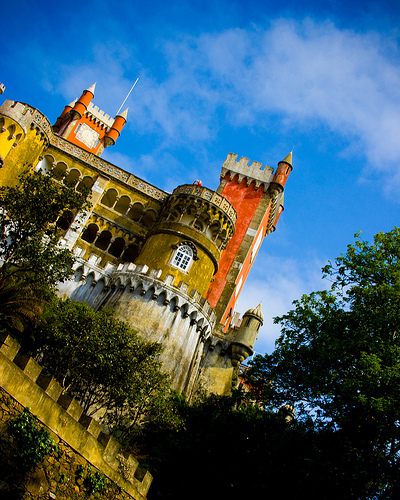 However, if you head northwest from Lisbon, there is another exciting area that is not only filled with medieval castles and legendary tales of heroism, but was also considered a mecca for Portuguese wine back in the 19th century. Stretching along the Atlantic coast, Estremadura is the second largest Portuguese wine producing region in Portugal, elaborating approximately 311,000 hectoliters in 2006. Estremadura, meaning “Land’s End” – I assume for its treacherous location back when one might have cross a series of mountains – is comprised of ten subregions which I will get into more detail below: Encostas de Aire, Alcobaca, Lourinha, Obidos, Alenquer, Arruda, Torres Vedras, Bucelas, Colares and Carcavelos. We drove through this region in route to a Portuguese winery about a month ago and were both astonished as to how gorgeous and diverse the landscape was throughout this tiny little region. Containing everything from undulating lush green terrains to steep and desolate mountain ranges of Candeeiros and Montejunto, it’s a place you want to rent a car and get lost in. As you drive past miles of orchards, stop for a moment and pick a juicy ripe pear directly from tree savoring the sweet flavor while looking out over stretches of rolling hills. Another option, something I rarely do enough of, is to stop at a local market and pick up some regional food for a picnic – the more bizarre and foreign looking, the better. Then drive until you find the perfect location, such as the sand dunes along the coast, to stop and experience the region without entering a museum, monument or crowded tourist area. Instead, hang out, take a breath, and savor every strange flavor you taste, comparing it to the flavors in the wine. Is there similarity or a difference in the aromas and flavors. And, since your in a rental, search through the radio stations until you find some traditional Fado music to compliment your lunch (compliment may be a strong term since I think Fado tends to get a little depressing after awhile, so you may want to prepare yourself to do a little station flipping). Located along the famous Tejo river, this region historically became famous by the efforts of Marquis de Pombal who founded the Companhia das Vinhas do Alto Douro, establishing the first demarcated wine region in the world. He also produced a “vinho generoso” that was later recognized under DOC Carcavelos where the estate is now. For more information on the region and their wines, you can check out our visit at Quinta do Gradil. The region of Bucelas is located approximately 20 km north of Lisbon near the Trancão river. Dangerously close to being abandoned in the 1970s, the region is now thriving with over 300 ha. of vines. 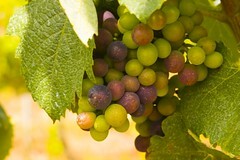 It is also the home of the Arinto grape. Arinto, also known as Pedernã in the Vinho Verde region, produces high acidity and characteristically floral white monovarietal wines that are said to improve with age. If you look back at our article on aging white wine, I think you might find these wines ideal to conduct a little cellar experiment with! Vines are planted on marl and limestone soils, called “Caeiras”. Wineries to look out for include: Quinta da Murta, Quinta da Romeira and Chao do Prado. Colares is a small village on the slopes of the Serra de Sintra Mountain. Years ago, Ryan and I had visited a town quite close to Colares called, Sintra, finding it to be one of the most beautiful areas in Portugal. A location of vast botanical wealth, beautiful landscapes, thick green blankets of moss and some of the best squid steaks we’ve ever eaten in our lives. Thick, juicy and just plain good! The region is comprised of two distinct subzones: sandy soils, or dunes, and limestone called “Chão Rijo” or hard ground. Interestingly, this is one of the only region in the world where the Ramisco grape is cultivated. 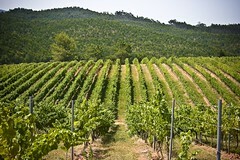 Growing horizontally on sand dunes, the grape’s cultivation has now been reduced to a measly 10 ha. Once planted, the Ramisco grape sinks its roots 8 meters below the surface where it latches onto a hard clay surface. The vines are later propped up on canes just a few inches from the sandy soil, allowing additional ventilation and space for the grape bunches to grow. Dead center of Estremadura, we find the largest vine area in the region planted along slopes of the rolling green hills. Although historically, this region laid claim to elaborating great white wine, the best DOC wines now come from red grape varieties such as Castelão, Aragonez (Tinta Roriz), Touriga Nacional, Tinta Miúda and Trincadeira, Alicante Bouschet, Touriga Franca, Cabernet Sauvignon and Syrah grapes; while, white wines typically are made from the Arinto, Fernão Pires, Seara-Nova and Vital grape varieties with the occasional planting of Chardonnay. Check out wines from: Quinta do Paço, Quinta dos Loridos, Adega Cooperativa do Cadaval, Quinta do Sanguinhal, Quinta do Manjapão and Quinta das Cerejeiras. Sidenote: There is an incredible liqueur from this region called Ginja. Made from the local Ginja cherry, it is traditionally given as a form of “welcome” when entering someone’s home; although nowadays, you can find ginja stands throughout Lisbon where you can get a quick shot while in route to your intended destination. Alenquer, located north of Bucelas, produces some of the most esteemed red and white DOC wines in Estremadura that as a result of their protected location from the Atlantic winds, allow these low alcohol, yet concentrated wines to improve with age. Although we have provided a list of 10 wineries, or quintas, to check, I’d like to highlight one in particular, Quinta de Pancas. Quinta de Pancas is one of the oldest wineries in the Alenquer region. Remaining in the family since the 15th century, it has gone through the hands of the Perestrello family, of which Christopher Columbus’s first wife belonged, as well as António Lopes Perestrello, the captain of one of several ships that carried Vasco da Gama to India in 1498. Although we haven’t had the opportunity to try these wines as of yet, from what I’ve read, their wines have won several awards internationally and are said to be incredible. Other wineries to look into are: Quinta do Carneiro, Quinta D. Carlos, Casa Santos Lima – Quinta da Boavista, Casa Santos Lima – Quinta da Espiga, Quinta de Chocapalha, Quinta do Anjo, Quinta do Monte D’Oiro and Quinta da Margem D’Arada. Encostas D’Aire, is the largest region in Estremadura planting a variety of both native varietals, such as Baga or Castelão, Arinto, Malvasia Fina and Fernão Pires, as well as foreign varietals like Chardonnay, Cabernet Sauvignon, (although foreign to the region, these last 3 varietals are native Portuguese grapes) Aragonez, Touriga Nacional and Trincadeira. And although the wine producing area extends over 500 ha. only a small percentage of this land is used under the Regional Demarcation. Dominated by cooperatives, the region has made a name for itself for its crisp, fruity and aromatic wines. Wineries located in this region include: Encostas de Aire, Facia, Quinta da Serradinha and Rota do Sol.